Add safety and confidence to your shower routine with this premium-quality easy transfer bench. Its contemporary design features a large handle to make sitting down and standing up more comfortable. 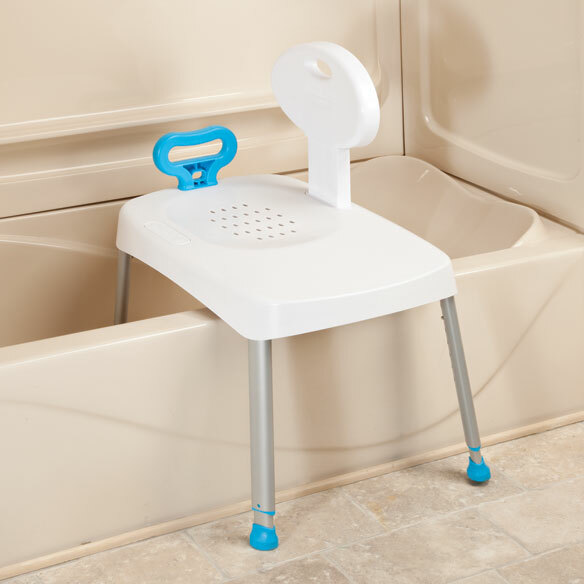 Safety features include sturdy legs with non-slip tips and seat drainage holes to prevent water pooling. Add safety and comfort to your shower or tub. Shower seat back adjusts for right or left entry. Seat height adjusts from 17”–23”. 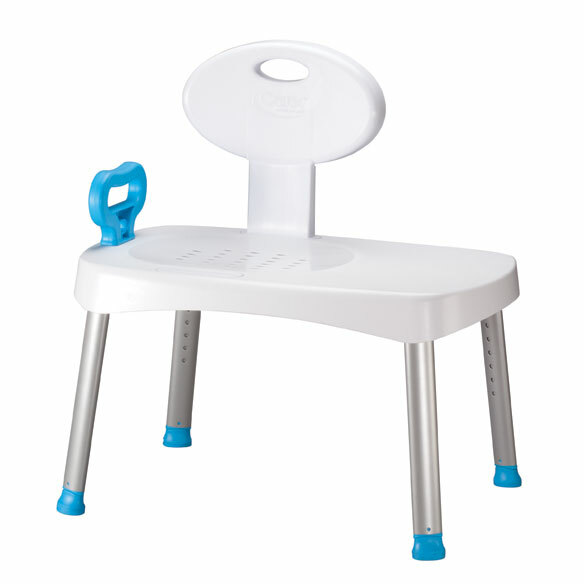 Durable plastic seat and aluminum legs. Shower bench supports up to 300 lbs. Clean with soap and hot water. $10 additional shipping charge; no express shipping. I have been looking for a transfer bench that I'm used too, but no one seems to carry these benches now. They are so much more complicated! Mom can't stand for long. Plus it should help in her not falling in the shower. Requested by my paraplegic wheelchair bound son.. It is safer than the one I have and hopefully better. How wide is the chair between the legs? Not front to back but from side to side. Have a garden tub and need to know dimensions. BEST ANSWER: Thank you for your question. The inside measurement from front to back is 16 1/2" and outside measurement from front to back is 20 1/2". We hope this information will be of help to you. Is there a similar one less expensive? BEST ANSWER: Thank you for your question. Unfortunately no there isn't. We hope this information will be of help to you.